The Harris County Law Library will offer the latest installment of its Legal Tech Institute Lecture Series on January 17, 2019 at 12:00 pm. The presenters, Amy Small, Assistant Director of the Texas State Law Library, and Joseph Lawson, Deputy Director of the Harris County Law Library, will discuss strategies for using free and low cost legal research sources effectively. Attendees will learn to approach legal research systematically, utilizing free resources available online, including the e-books and legal databases in the Texas State Law Library’s digital collection. Presenters will also discuss how to use Westlaw and Lexis Advance, which can be accessed for free on site at the Harris County Law Library. To enroll in this course, please visit the Blending Your Legal Research registration page. 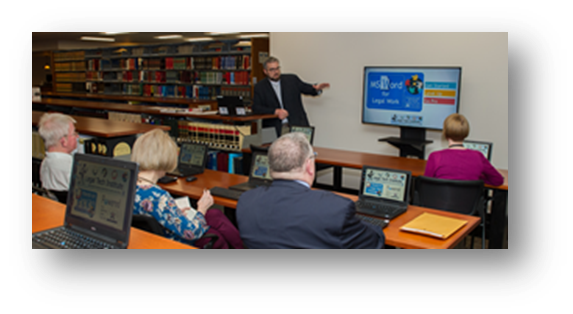 Look for other Legal Tech Institute programs, including the Hands-on Legal Tech Training classes offered every Thursday at 2:00 pm in our Legal Tech Lab in the Law Library. Our 2019 Course Catalog has just been published and is now available via the Legal Tech Institute online. The Harris County Law Library’s Legal Tech Institute today released the 2019 Course Catalog for its Hands-on Legal Tech Training Program. This year, law librarians will teach nine courses on rotation at the Law Library’s Legal Tech Lab. Each course will focus on tech skills needed for legal work in a digital environment. Training sessions are free and open to all, and most carry free continuing legal education credit for Texas attorneys courtesy of the CLE Committee for the Office of Vince Ryan, Harris County Attorney. Two instructors lead small classes of nine participants to ensure an interactive environment where students can ask questions and practice skills as they learn. Laptops funded by a 2017 grant from the Texas Bar Foundation are provided or participants can bring their own devices. Each class also touches on skills for all in attendance, from beginners to pros. Visit the Legal Tech Institute website at www.harriscountylawlibrary.org/tech to download a copy of the Course Catalog and to register for an upcoming training session. Anyone who is unable to register on the website can find assistance from 8 a.m. to 7 p.m. Monday through Friday at the Law Library’s reference desk, located at 1019 Congress Street, 1st floor, Houston, Texas 77002, or by phone at (713)755-8153. Happy New Year... and, also, Happy Public Domain Day! New laws go into effect in Texas! While most laws from the last Texas legislative session went into effect in September, some have an effective date of today. Check the Effective Dates for Bills page on the Texas Legislative Reference Library’s website for details. New Hampshire by Robert Frost is one of many works from 1923 entering the public domain on Jan. 1, 2019. For many years, copyrighted works regularly entered the public domain each New Year’s Day. However, in 1998, Disney successfully lobbied Congress to extend existing copyrights by 20 years. Today marks the first time in two decades new works will be released for copyright-free use. Visit the Duke Law School Center for the Study of the Public Domain website for a listing of books, movies, and music published in 1923 that are now available to all. The Harris County Law Library will close early on Monday, December 31, 2018 at 5:00 pm. We will be closed on Tuesday, January 1, 2019 and will reopen on Wednesday, January 2, 2019 at 8:00 am. The Harris County Law Library wishes you and yours a very joyous holiday and all good things in the year ahead. Navigating the law, especially for the non-lawyer, can be daunting, confusing, and frustrating. We at the Harris County Law Library provide resources and information that, we hope, make the law less intimidating and more accessible to the general public. One of the best, most indispensable tools for those who need to get acquainted with a new area of the law is a collection of books from Nolo Press, a publisher of legal materials, written in plain English, on a wide variety of legal topics. Designed to assist self-represented parties in learning about the law, Nolo Press is a company that seeks to “make the law accessible to everyone." In addition to the Nolo Press publications, the Harris County Law Library's self-help collection contains a number of accessible, user-friendly resources including the Nutshell series from West publishing and the Texas Young Lawyers Association Research Guides for the general public. Nutshells are concise, one-volume treatises that address a particular area of the law, and the TYLA guides provide very practical information for handling specific legal matters in Texas, including probate, CPS cases, guardianship, and divorce. The Nolo collection is a bit more expansive, as it covers all of the following topics and more: bankruptcy, criminal law, immigration, family law, labor and employment, landlord-tenant, estate planning, and social security. Other titles address how to start a small business, file a suit in small claims court, repair your credit, dispute a traffic ticket, survive foreclosure, and win a personal injury claim. If you are unable to visit the Law Library in person, there are several options for accessing self-help legal resources online. The Nolo books, in particular, are available through several channels, including the Harris County Public Library, the Houston Public Library, and the Texas State Law Library online. As members of the TexShare Libraries Consortium, these institutions offer access to the Ebsco Legal Information Reference Center, which provides full-text digital versions of all titles published by Nolo Press, including some titles not included in the Harris County Law Library print collection. (The Texas State Law Library also provides access to the West Nutshell series.) To gain access to this online database, you must have a valid library card for one of the institutions named above. All residents of Texas are eligible to receive a library card, simply by filling out an application in person or by requesting a library card from the Texas State Law Library via the library's web portal. The Legal Tech Institute at the Harris County Law Library has released a new video CLE. Fulfilling Ethical Obligations with Legal Research is the latest additional to our Learn On-Demand CLE library that lets you earn CLE credit in Texas while staying up to date on legal tech. Visit the Law Library's Legal Tech Institute page for more legal tech learning opportunities. You’ve probably heard the term “blockchain” before. You also probably know that it is one of the newer and constantly evolving technologies that can change the way business is conducted. But, do you really know what it is and what it can do for you and your law practice? Co-editors James A. Cox and Mark W. Rasmussen have teamed up with a host of experts to explain and (hopefully) demystify this innovative technology in their new book, Blockchain for Business Lawyers. To do this, the authors begin with an introduction to blockchain technology, discussing its origin, its implications, and its advantages and disadvantages for business. Succeeding chapters define cryptocurrencies and initial coin offerings, describe some other financial blockchain applications, and discuss smart contracts, their ramifications and their enforceability. From a legal perspective, the authors examine securities and commodities laws and regulations, antitrust regulation and key antitrust issues, federal and state regulation of money transmitters, state laws addressing blockchain technology, and the means of resolving disputes arising from use of blockchain. No discussion of technology would ever be complete without an explanation of data security and privacy. So, if you want to know what all the buzz is about blockchain, be sure to have a look at Blockchain for Business Lawyers. Find it in our Legal Tech Collection. Throughout the month of December, the Law Library will feature a number of self-help resources for pro se litigants. Handbooks, research guides, and concise legal treatises, including those in the Nutshell series from West Academic Publishing, will be on display in the library. We will also feature a number of do-it-yourself websites, including TexasLawHelp.org, on our blog. As always, the Law Library staff is happy to help you identify resources from our collection that will meet your legal needs. Please stop by the reference desk for assistance. You may also consult our Community Legal Resources guide where we've provided contact information for a variety of legal assistance organizations in the greater Houston area.